Absolutely love it!!! Just what I wanted!!!!! Excellent quality. Is as described. Beautiful fabrics and stitching in old fashioned style of quilting. Its large and more than covers my Queen size bed. Not the colors that I expected. Bought the shams to match the quilt and very happy with the look and the quality! Definitely recommend! Completes the look with the Ashmont shams. Three buttons on the back hold the sham closed. As soft as the matching quilt! Worth every penny. I received this at the same time as I did the quilt. Naturally, it's a perfect match. It completed the look that I want for my master bedroom, and I couldn't be happier. 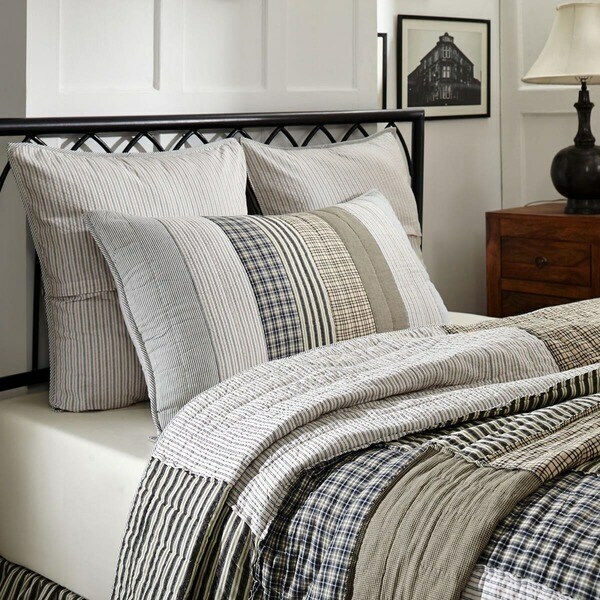 As an aside, I almost never buy bedding online, but this had the look and feel that I couldn't find anywhere. Absolutely beautiful! Clean looking and match my grey and beige decor perfect! I got the whole set. Using in a boys room. Heavy material but not to heavy. Purchased the sham for my boys room and love how it looks with the quilt. Very satisfied. Will definitely look to purchase more from this brand. I love the shams!! They were just what I was looking for. Looking forward to using it on our new bed! I ordered the king shams. I need to return. The standard shams will be a better fit.